Discs of TRON is a shooter arcade game that was released by Bally Midway in 1983; it was the first game to run on that company's then-new MCR-3 hardware (two Zilog Z80s, running at 5 and 2 MHz, with a Motorola M6802, running at 895 KHz). 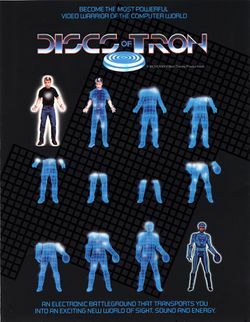 As the name suggests, it is the sequel to TRON, which was released in the previous year and based on the Disney Corporation's movie of the same name - and the player must use an 8-way joystick (which has a trigger and thumb button) along with a rotary controller to again take control for the eponymous "TRON", whose objective is to throw discs at Sark (an antagonist from the movie), to knock him off his platform in the far distance. You will receive 100 points for smashing one of Sark's discs, 200 points for smashing one of his energy discs, 400 points for smashing one of his chasers, 800 points for smashing one of his super chasers, and 1600 points for smashing one of his energy pellets; you'll also receive 200 points, for grazing Sark himself, 1000 points for "derezzing" (destroying) him, and 2000 points for "derezzing" his platform. This game was originally going to be a part of the original TRON arcade game, but it was removed, towards the end of development - and, it was later ported to the Commodore 64, along with the Amstrad CPC (under the name of simply "Disc"). In 2004, it got rereleased on the Game Boy Advance under the name of Tron 2.0: Killer App, and in 2007 on the Xbox 360 as a part of Xbox Live Arcade; this was also the first game from Bally Midway to come in an "Environmental" cabinet as well as the standard upright which was named because it attempted to replicate the environments TRON was in. Players would stand inside the cabinet upon a disc, and lights around it would flash when TRON was killed on the screen - but unlike the upright, it only allowed one player because a second one could not fit inside. This page was last edited on 6 October 2017, at 15:30.